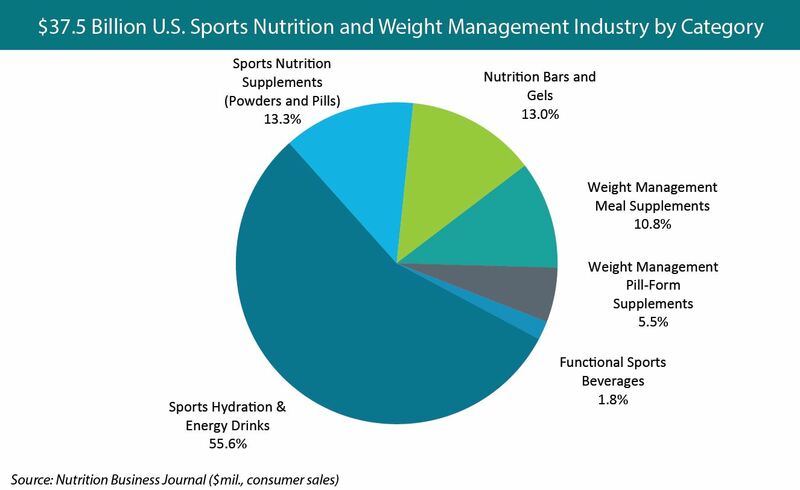 Sports nutrition and weight management is a booming industry, growing 7.0 percent in 2016. As sports nutrition extends more to activities outside the gym, and as weight loss becomes more about managing weight and lifestyle than dropping a few quick pounds, the lines across categories can get blurry. This $36.5 billion industry continues to be dominated by sports hydration and energy drinks, with over half of the market share in 2016. On the other end of the market share spectrum are functional sports beverages, such as RTD protein drinks, with only 1.8 percent of sales. However, functional sports beverages is the strongest growing category in the space, followed closely by growth of nutrition bars and gels. This shows an increasing consumer interest in convenient options that are full of protein. Innovation in these products includes a growing variety of plant-based proteins, from pea to coconut. There continues to be a huge opportunity in creating products to fuel our daily lives. There's more where that came from. NBJ's Sports Nutrition Weight Management Report is available for purchase here.